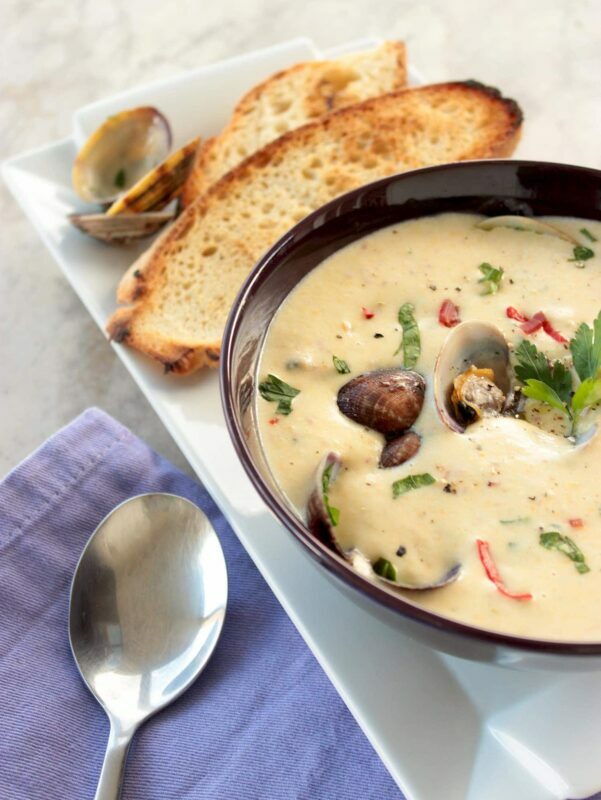 A classic New England clam chowder – Fresh clams, potatoes and bacon make this soup impossible to resist. Having my roots well held in Sicily, there was no way for me to eat clams rather than with pasta. Then a few months ago while on holiday in Ireland, we were desperate for dinner. After finding an american-style restaurant, I’ve tasted for the first time a New England clam chowder. It was rich and bold, full of aromatic flavors and so, so tasty. The perfect bowl of goodness to warm myself up after a long day exploring Dublin. New England clam chowder is milk/cream-based chowder, and it’s an american traditional recipe, occasionally referred to as Boston chowder. Fresh clams, basic vegetables like potato, carrot and potatoes, and some extra simple ingredients come all together into a silky heart-warming soup. Make sure you don’t add tomatoes: in 1939 the Maine legislature declared illegal to add them to the clam chowder. But you fancy adding tomatoes in place of cream (making it “Manhattan-style”) is totally ok.
Once back home, I was up for the challenge and so curious to recreate this traditional recipe. To my surprise, I loved every single scoop of this delicious chowder and it was very similar to the one tasted in Ireland. It has quickly become a regular hit at the dinner table. It’s just the comforting meal you need on a chilled fall evening. It took me days to develop just the perfect recipe, but now I’m super proud to share this with you all. What about you, have you ever tried a traditional New England clam chowder? Write a comment below and let me know how you liked it. Or even better, take a picture and tag it #thepetitecook on Instagram! I can’t wait to see your pictures! Soak the clams in a bowl with cold water and kosher salt for an hour. Wash them through afterwards. Heat a large pan over med-heat with the garlic and 2 tbsp of oil. Fold in the clams, cover with a lid and cook for about 5 mins, until the shells open and they release the liquid. Turn the heat off and discard the garlic. Once ready, filter the clams liquid and set aside. Remove the clams from their shells and set them aside, use some of the shells for decoration and discard the rest. Heat a large pan with 1 tbsp of oil over med-heat. Add in the carrots, celery and onion, thyme and bay leaves. Saute for 5 mins, stirring occasionally. Add in the potatoes and bacon, stir fry for a min, then pour in the clams liquid. Cover with a lid and cook until the potatoes are softened. Pour in the double cream, season to taste and bring to a boil. Turn the heat off and discard the bay leaves. Blend the mixture until smooth. Transfer back to the pan, add in the reserved clams, sprinkle with parsley and chili and season to taste. Stir all ingredients and serve with toasted ciabatta. Someone got creative with the copy here. 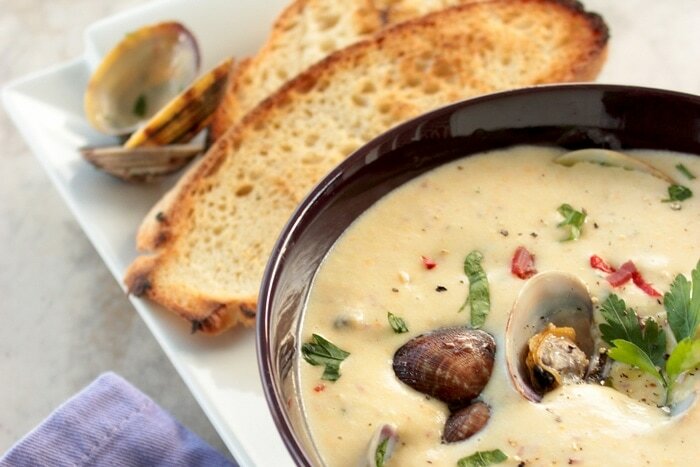 A traditional New England clam chowder inspired by a trip to Dublin? I’m second gen irish American and grew up in Connecticut. This recipe misses a traditional clam chowder by a mile.tomato is for Manhattan style .Chowder and never finds its way into a traditional New England pot. Garlic? Really? I like this site and often pull inspiration from it. This recipe is a do over.for the record new England is Connecticut,Massachusetts,Vermont,New Hampshire and Maine. Take a road trip. Hi John, thank you for your raw comments :). I’ve never said it was a traditional meal from Ireland. I’ve only said I discovered it while on holiday in Dublin, which I’m sure you know is full of international restaurants, including american-style ones where I got to try this recipe. Unfortunately I’ve never been to US, but it doesn’t mean I don’t know where New England is.